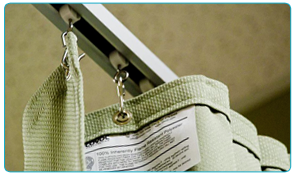 Covoc’s hospital curtain tracks are made to order and can be customized to fit your space. Our #8770 Track* is perfect for medical facilities and other applications and is available in four finishes: Anodized Aluminum, Black, White and Pink. It can be supplied in straight lengths or curved to meet your particular needs. Each foot of hospital curtain track includes 3 roller carriers with hooks, 1 end stop per track, and 1 end stop with pullout per track. Need more information on our hospital curtain tracks? Click here for more on installation, configuration, measuring, specification details and components. *If you have ceiling obstructions like light fixtures, vents or sloped ceilings, you can install our hospital curtain track below the ceiling at a fixed level height using our 3/4" square suspension tubing and component parts. See our hospital curtain track installation detail drawings here.